The NTC was founded in Hong Kong in 1963 by Sister Kong (Jiang Duan Yí, Kong Duen Yee or Yee Mui [stage name]; 1923-1966). Kong had achieved fame as a Hong Kong movie star, starring in a string of films throughout the 1950s before retiring due to poor physical and emotional health. It appears that for now at least, the legacy of her film career has been eclipsed by that of the church she founded. Kong was rejuvenated in 1957 when she enthusiastically returned to Protestant Christianity, the faith in which she was raised. From 1959 until her death she travelled across South East Asia, preaching the gospels and developing her nascent church. Kong met Elijah Hong (born 1927) in 1965 in Taiwan. Hong is the present leader of the NTC and is known to those in the church as “God’s Chosen Prophet of All Nations”. Hong and several of his colleagues had left the Assemblies of God church (Pentecostal) in 1963. They embarked on an expedition into Taiwan’s southern interior where God led them to a mountain. At this undeveloped mountain, which was eventually to be known as Mount Zion, they intended to wait for God to reveal His new prophet to them. Conveniently, a prophet (in the form of Kong) arrived within a period of just two years and Hong and his colleagues joined the NTC. However, Kong passed away shortly thereafter, entrusting her daughter Ruth Cheung with the leadership of the NTC. Cheung’s tenure at the helm was fraught and factions developed in the church over the extent to which she was adhering to the teachings of Kong. Following a protracted leadership struggle, Hong eventually took control of the NTC in 1976. Since becoming the leader of the NTC, Hong has shifted the church’s base to Mount Zion. The NTC believes that the Mount Zion in Taiwan is the real Mount Zion; God has forsaken the traditional Mount Zion in Israel as well as the Jewish people. The adherents of the NTC consider themselves to now possess the religious status of the Jews as they are “spiritual Israelites”. Mount Zion is home to 300 people who operate a large organic farm there. It is also the primary pilgrimage destination for the NTC, whose adherents are spread throughout Asia and the world. 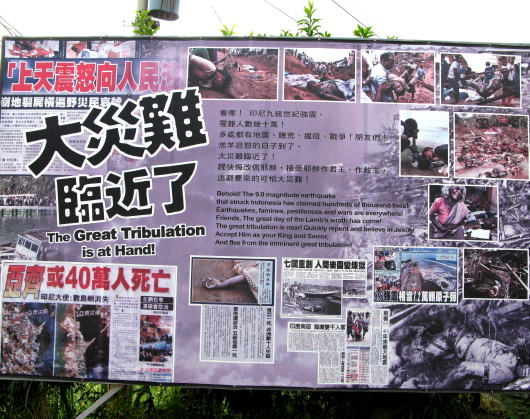 A poster on Mount Zion showing images from the Boxing Day tsunami. 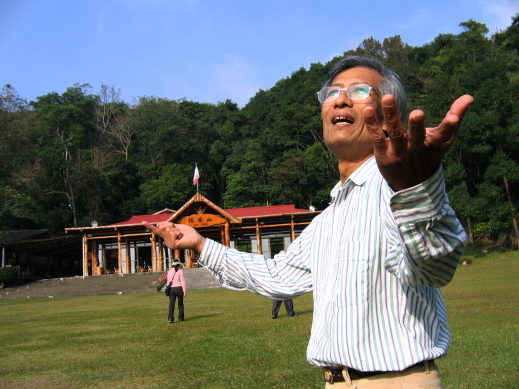 As “God’s Chosen Prophet of All Nations”, Hong has now guided the NTC for more than three decades. Throughout this, he has reinforced the belief that an imminent and rapid transformation of the earth is at hand. Such millennial beliefs are not unusual and can be found in faiths across the globe. Known in Christianity as the Rapture, this spectacular event will see the NTC’s adherents ascend into heaven, leaving the rest of humanity behind on earth to experience a series of calamities as described in the Book of Revelation, known as the Tribulation. Natural disasters are often referenced by the NTC as signs of the Tribulation’s imminence. I visited Mount Zion in 2007 and 2008 and have since had discussions with NTC adherents both in Taiwan and Australia, and on every occasion natural disasters were brought into the conversation. These tragedies have a clear message for NTC adherents: stay alert and true to the tenets of the NTC as the Rapture is forever getting closer – those who are not vigilant will not be raised up into heaven. Mount Zion itself is dotted with posters that illustrate the link between natural disasters and the end of the world. One poster that caught my eye in 2007 showed Mount Zion rising above from a large body of water that flowed into a waterfall that was crushing a city below. At the time I was struck by the powerful nature of this seemingly far-fetched image. Strangely enough, less than two years later this poster has proved to be more than just a dramatic representation of the stability of Mount Zion, the mountain described in Psalms 125:1 as that “Which cannot be moved, but abides forever” (Italicised in source). This poster managed to prophesise the water flowing past Mount Zion to cause chaos downstream during Typhoon Morakot, albeit in an exaggerated manner. 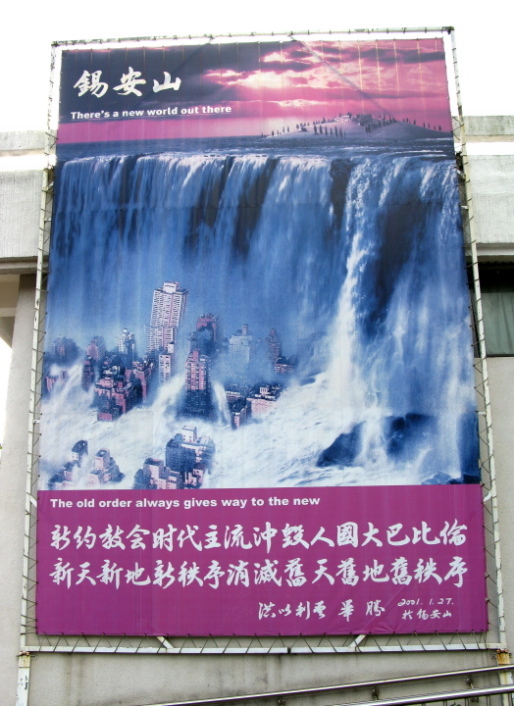 A poster depicting Mount Zion atop a waterfall that crushes a city. The district around Mount Zion was devastated during Typhoon Morakot. Mount Zion itself was not impervious to the fierce weather, with access roads on its steep slopes washed away and an auxiliary farm at the base of the mountain obliterated by a landslide, killing seven NTC adherents. The tragic events of Typhoon Morakot shook Taiwan but galvanised the NTC. The church took advantage of this chance to feature on Taiwan’s media, with TV news programs broadcasting images of NTC preachers forcefully admonishing the KMT and confronting President Ma Ying-jeou when he visited Hsiao-lin. The NTC’s message was blunt – the arrogant Ma must repent for the KMT’s exploitation and dynamiting of nearby land for water diversion projects as these had left the valley vulnerable to the force of the typhoon. Somewhat more graphically, NTC adherents raised banners foreseeing that as opponents of the Kingdom of God, Ma and the KMT will perish. Such forceful denouncements of the KMT are nothing new for the NTC. Its long running hatred of the KMT was solidified during the NTC’s seven-year exile from Mount Zion in the 1980s. It is not clear if the NTC has always been so vehemently opposed to the KMT. Just as the pre-exile histories of the NTC and Hong do not seem to suggest if earlier events triggered this loathing of the KMT, they do not include any praise for the KMT either. In 1980 the NTC was evicted from Mount Zion by the KMT government due to what was essentially a zoning dispute. This eviction coincided with the KMT’s crackdown on pro-democracy groups following a riot in the southern city of Kaohsiung in December 1979. While unyielding in arguing its spiritual entitlement to Mount Zion, the NTC also claimed that it was legally entitled to the property. During the exile NTC adherents camped out in the riverbed at the base of Mount Zion where they were exposed to floods and occasionally clashed with government security forces. The NTC’s exile was also punctuated by protests around the island as adherents attempted to raise awareness about their plight, framing the issue as an abuse of human rights. Eventually a truce was brokered and the NTC returned to Mount Zion in 1986, not long before martial law was rescinded. While the NTC solely pledges its allegiance to ‘the kingdom of God’, in 2008 a spokesman told me that adherents are free to vote in elections if they wish. Taiwan’s other main political party, the Democratic Progressive Party (DPP), appears to be spared invective similar to that aimed at the KMT. Nevertheless, the NTC does not go as far to endorse the DPP or any other political party. 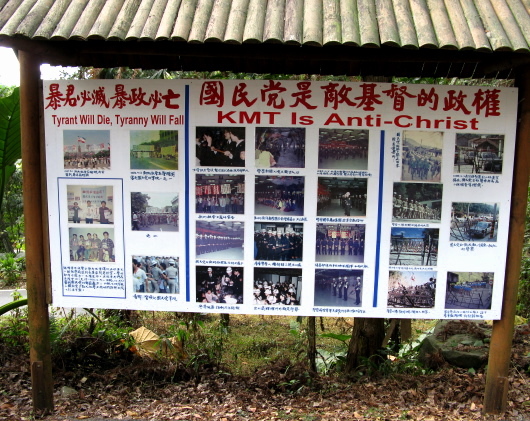 A sign board on Mount Zion – “KMT is antichrist”. 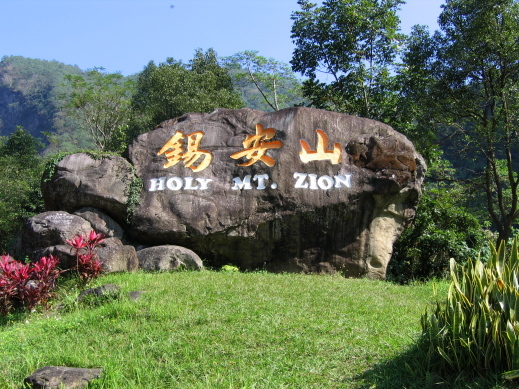 Prior to Typhoon Morakot when Mount Zion was more easily accessible, visitors to the mountain were confronted with graphic anti-KMT posters, violent images (NTC adherents injured in clashes with police during the exile) and statements (“KMT is Anti-Christ”). These images contrast sharply with the serenely bucolic atmosphere that pervades the nearby fields and holy sites. Despite maintaining a less volatile relationship with the state since martial law was lifted in 1987, Hong remains ever strident in condemning the KMT from the pulpit and predicting its downfall. More importantly, the catastrophic damage from the typhoon has provided Hong with another sign of the increasingly imminent Tribulation, something he has made a number of references to over the past thirty years. Hong reiterated this message to the NTC in a memorial DVD quickly distributed throughout its network in the wake of the deaths at the base of Mount Zion in Typhoon Morakot. Importantly, Mount Zion had never before been directly threatened by a natural disaster on this scale, one that the church says will alter the history of Mount Zion and the NTC forever. The proximity of Typhoon Morakot to Mount Zion and the storm’s destructive power introduces a sense of immediacy that other disasters from around the world did not have. The landslides around the mountain and torrents of water that surged through the valley have irrevocably altered the landscape. This large rock at the base of Mount Zion was washed away during Typhoon Morakot. More importantly for the NTC, the seven adherents who perished defending Mount Zion from the torrential rains have set an example for those left behind. These seven “saints” were working selflessly for God right up until the moment of death. Having ascended to heaven, they demonstrate to other adherents the importance of staying true to the beliefs of the NTC – never stop working for God and you will be saved. The memorial DVD contains biographies and interviews with the friends and family of each of these “saints”. For the most part, they are shown to have had their faith tested by hardship and doubt, only to have returned to the church stronger than before. While the memorial DVD shows the community on Mount Zion in much sadness and pain during the fruitless search for survivors, in the following weeks those interviewed offered more considered emotions. The wives, mothers and friends left behind praise the commitment and faith of the “saints”. One young wife, in a calmly detached manner, admonished herself for being weaker than her valiant husband in adhering to their beliefs. The classmates of the youngest “saint” even expressed surprise that the worst student somehow was the first to ascend to heaven. This student had experienced a transformation in attitude and faith not long before his death, showing increased commitment to his studies and the NTC’s endeavours on Mount Zion. This passage unambiguously describes the post-Typhoon Morakot state of mind of the NTC – the Tribulation is nigh, once again, and those who have following the church’s teachings will soon be Raptured into heaven, regardless of where they are in the world. At the time of writing, the Rapture was still yet to occur. In the past, the NTC has made a habit of drawing upon global disasters to illustrate the imminent apocalypse, however the events of 2009 were of an altogether different magnitude. That a disaster on the scale of Typhoon Morakot could unfold on and around Mount Zion was ideal for Hong – he had the perfect sign for a renewed prediction of the Tribulation. The damage on Mount Zion was significant—the loss of seven NTC lives even more so—with the typhoon’s destruction beamed on news channels around the globe. Ultimately Mount Zion remained standing atop a radically altered landscape. Small signs such as this one are placed all over Mount Zion. 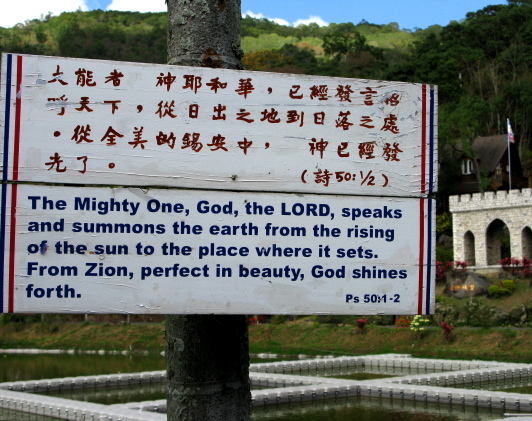 This sign is in front of the Heavenly Pond and David’s Citadel. Upon it the NTC’s adherents continue to wait out the days to the Rapture, just like they have done since 1963. However, for the time being there is a heightened sense of immediacy. Hong is now 82 and while he has recently demonstrated considerable vigour in both berating the KMT from his pulpit and scouring the hills and valleys around Mount Zion for survivors of the typhoon, he is running out of time to witness the Tribulation – the ultimate purpose for which Mount Zion was created. The NTC has endured many hardships during its existence and has so far managed to survive each time. How it rehabilitates Mount Zion after Typhoon Morakot will be interesting to see. Of even more interest will be the manner in which the NTC continues to utilise the experience of Typhoon Morakot as a sign of the impending Tribulation. A PDF version of this article, including the names in Chinese characters and the photographs in larger size, is available and can be downloaded here (520 Ko). Paul Farrelly is currently studying Mandarin in Taipei and is the English editor at erenlai.com. He is a graduate of the Masters program at the Australian National University and has a keen interest in new religious movements and religious innovation, particularly in Taiwan and China.